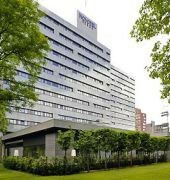 Novotel Amsterdam City is a 4 star property located in the heart of Amsterdam's business district, a short stroll to the Amsterdam RAI Exhibition and Convention Center and World Trade Center. The hotel is just a few minute walk to RAI train station that links to Amsterdam city center and Schiphol. All spacious and modern accommodations offer an air conditioning, mini bar, tea and coffee making facilities, in-room safe, satellite flat-screen TV, telephone, wireless internet access and private bathroom with amenities. 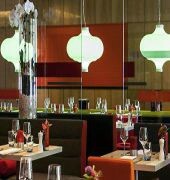 Dining options include 2 restaurants serving international and Asian cuisines with a wide variety of sushi and wok dishes cooked in an open kitchen. The on-site bar lounge offers an extensive menu of alcoholic and non alcoholic beverages and tapas. Guests have a direct access to the hotel's fitness centre complemented with sauna. Massage services and bicycle rentals are also available with additional cost. Amsterdam Schipol Airport is 13 km away. 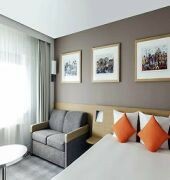 The NOVOTEL AMSTERDAM CITY HOTEL is a Tourist, Pet Friendly, Modern, Business, Leisure, City hotel, Design Trendy, Child Friendly, Eco Friendly hotel. Located in Amsterdam South area. Shopping is within walking distance and the nightlife/restaurants are located in the hotel. 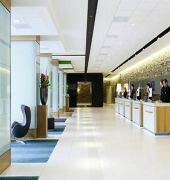 Descriptionclass="small" style="text-align: justify; font-size:11px;">Novotel Amsterdam City is a 4 star property located in the heart of Amsterdam's business district, a short stroll to the Amsterdam RAI Exhibition and Convention Center and World Trade Center. The hotel is just a few minute walk to RAI train station that links to Amsterdam city center and Schiphol. All spacious and modern accommodations offer an air conditioning, mini bar, tea and coffee making facilities, in-room safe, satellite flat-screen TV, telephone, wireless internet access and private bathroom with amenities. Dining options include 2 restaurants serving international and Asian cuisines with a wide variety of sushi and wok dishes cooked in an open kitchen. The on-site bar lounge offers an extensive menu of alcoholic and non alcoholic beverages and tapas. Guests have a direct access to the hotel's fitness centre complemented with sauna. Massage services and bicycle rentals are also available with additional cost. Amsterdam Schipol Airport is 13 km away. Me and my friend booked this hotel for our anniversary as a surprised trip for our husbands. We were greeted by very friendly staff and the check-in and check-out process was extremely good and quick. Two weeks prior to the trip, I emailed the manager of the hotel and requested if we could have the room/bed decorated with rose petals and this was promised to me. When we got to the rooms, nothing was decorated. We didnâ€™t have breakfast booked with our room so the first morning, I went down to get breakfast for my husband as he suffers from panic attacks and anxiety and he didnâ€™t want to sit in the breakfast area with everyone else. My room key was swiped so that I would be charged for breakfast â€“ which was absolutely fine. As I was walking out with a plate of food for my husband, the lady who works there said I am not allowed to take any food out and that she would also need to swipe my room key again, which would mean sheâ€™s charging me TWICE for breakfast. I advised her that I havenâ€™t eaten, and the plate was for my husband who suffers from panic attacks and has anxiety. She was arguing with me for a good few mins and it was quite embarrassing that I had to talk about my husbands issues in front of the other guests. I asked to speak to a manager who also was extremely rude and unhelpful. I kept saying, I havenâ€™t eaten anything from here and you can also check the cameras to see I havenâ€™t eaten anything, so why are you swiping my room key twice. Furthermore, I am a vegetarian and there was LITERALLY NOTHING vegetarian for me to eat (they had eggs â€“ but I donâ€™t eat eggs). In the end, he finally said you can go, but he was so rude about it and the fact that they tried to embarrass me about it was very unprofessional. My husband also said the food was rubbish and definitely wasnâ€™t worth paying to eat it. The second day, we ordered room service pizza. My husband ordered meat pizza and it was nothing like pizza. The cheese was hardly melted, and all the toppings were just chucked on topâ€¦...Not cooked! The pizza didnâ€™t get eaten so it was wasted. I think after two BAD experiences with the hotel food, itâ€™s safe to say the food here was rubbish and not worth paying for. Our last day (third day), we requested for the room to be cleaned. House keeping came to remove the old/used towels and didnâ€™t replace them with new/fresh ones and didnâ€™t clean the rubbish from the floor and bins. The bed was made, but it was still very messy. The location of the hotel is very good. Itâ€™s a 5 mins walk from the Metro and 15 mins drive from the airport. The only good thing I can say about this hotel is that the Reception staff are the only friendly staff we encountered with. I donâ€™t think I would recommend this hotel to anyone and when I return to Amsterdam again, I wouldnâ€™t come back to this hotel. I am very sorry to read that your experience in with our hotel was not up to our normal standards. As we have been in contact with you by email you will find our response on their. Thank you again for celebrating your special times with us and we hope that our apologies are sufficient enough that you would give us a second change when you visit Amsterdam. My husband and I stayed here for two nights while visiting Amsterdam as part of a holiday and were very happy with our experience. The service when we checked in was excellent, very friendly and efficient, and we were upgraded to an executive room free of charge, which was a nice surprise. The room was on the small side, especially the tiny bathroom, but had everything we needed including nice coffee and tea facilities, and a very comfortable memory foam bed, and was clean and modern looking. The hotel gym was well-equipped and well-maintained, and the little snack shop in the lobby was very convenient. We parked at the hotel which had a decent daily rate for Amsterdam, and used the nearby metro, which was only a short 5 minute walk away and got us into the city in less than 15 minutes, so quite convenient for sightseeing if you don't want to spend twice as much to stay in the city centre. A slightly longer walk, just under 10 minutes, took us to a different Metro station on a different line, so we were easily able to access all the areas of the city we wanted to visit with ease. Overall a great stay, and we'd certainly stay again. We very much appreciate your comments regarding your stay at the Novotel Amsterdam City. Thank you for your kind feedback, and we hope to see you again soon for another pleasant stay with us. I stayed here for only 2 nights. There is a very cute coffee shop on the lobby floor. The location is great only 400 m. from the europlain metro station. However, its nearly half mile from the convention center. Room is small but adequate. A nespresso machine with free capsules is a plus. A little bit disappoint that they provide two disposable plastic cups in the bathroom instead of a real bathroom cup. This hotel is well outside of central Amsterdam near the RAI station (which is conveniently only 10 minutes from Schipol Airport). The hotel does not guarantee a room before the official checkin time of 15:00 and sure enough I had to wait until about 14:45 for a room to open (which is tough if one has flown overnight from another continent). The staff were friendly and helpful although did not go out of their way to help me with local restaurant reservations. This is one major shortcoming. There is a decent but not great restaurant and bar in the hotel but outside hotels are a kilometer or more away (and there are several excellent options if you have time). This is a large hotel with decent sized rooms but the hallways look run down--in need of renovation. There is a medium sized gym with standard exercise equipment (all of which was functioning) and weights. There was free wifi through the hotel. Thank you for the detailed review and for taking the time to share this with us and other TripAdvisor users. We also thank you for the feedback about what we can improve on and I will make sure to share your experience with our teams. Our hotel is indeed perfectly situated for guests that need to spend their time in Amsterdam at the RAI convention center. On the other side this puts us in a situation that we need to focus on the points that you mention regarding the F&B experience and also on informing our guests better on what restaurants are nearby. I am happy that your overall experience made sure that we still received a 4 out of 5 star rating and we will work on reaching the 5th. Thank you again for sharing your experience and we would love nothing more then to show you in the near future that we learned and improved from your feedback. Just as you would expect from a Novotel - a nice clean hotel. Decent size bedroom , average size bathroom. Large spacious foyer area, large restaurant and breakfast room. Very good breakfast with chef cooking omlettes to order, which is nice. Wow! so man kind words and compliments. I will make sure to share your great experience with our staff and I am sure this will work as a motivator to keep up their good work. The chefs always love to hear that their hard work is seen and complimented. We hope to welcome you back soon to make sure you have a great time again!